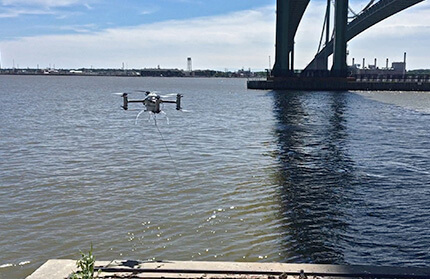 Rutgers’ Naviator, a unique autonomous device that can both fly and maneuver underwater, conducted the first combination aerial and underwater bridge inspection of the Delaware Memorial Bridge Twin Spans on June 18. CAIT has been assisting with development of the Naviator for more than a year, providing piloting and logistics support. The Naviator was created at Rutgers School of Engineering (SOE) by mechanical and aerospace engineering professor Dr. F. Javier Diez and his team, who launched the first prototype in 2013 after receiving a grant contract from the Office of Naval Research (ONR). 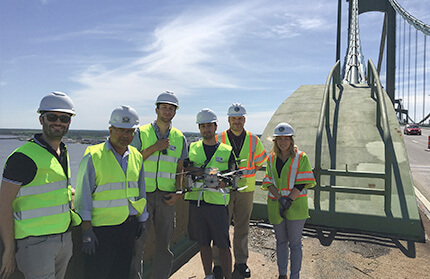 The bridge inspection test flight was a cooperative venture of the Delaware River and Bay Authority (DRBA), Rutgers SOE, CAIT, and SubUAS LLC. CAIT assistant research engineer Michael O’Connell was the pilot in command and Marco Maia was at the controls. Additional support for the inspection was provided by numerous DRBA bridge and ferry employees and Rutgers Center for Ocean Observing Leadership. The potential for this drone seems to be constantly expanding. The original ONR project conceived Naviator as a tool for surveillance of ports or other homeland security targets, especially during emergencies when other safety systems may be compromised. “The drone’s ability to repeatedly [transition between air and water] in less than two seconds has opened up novel markets that will find this amazing technology’s capabilities advantageous,” said Mark Contarino, vice president of technology, SubUAS LLC, the company founded to commercialize Naviator. Now, in addition to bridge inspections and keeping an eye on high-priority transportation assets, applications that already have been identified for Naviator include mapping of the ocean floor, search and rescue operations, humanitarian missions, and evaluation of environmental incidents like oil spills and algae blooms. SOE is an official Federal Aviation Administration (FAA) UAS testing facility doing research that will help the FAA integrate drones safely into the nation’s airspace.